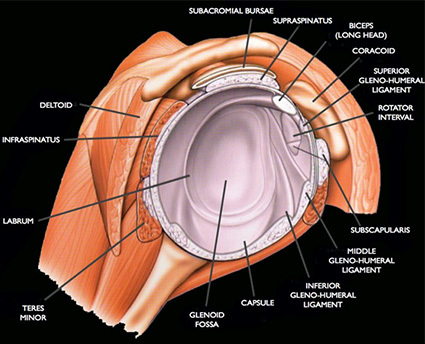 The shoulder joint is stabilised by the shoulder labrum (cartilage-like ring surrounding the glenoid), capsule (series of ligaments that connects the humerus to the glenoid) and the surrounding muscles. 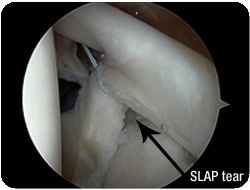 When the labrum and/or capsule stretch or tear, the shoulder has a greater risk to dislocate. This is known as instability, which can lead to other painful shoulder conditions. Dislocation and subluxation (partial dislocation) are the telltale signs of instability. The shoulder may dislocate out the front (anterior), out the back (posterior) or out the bottom (inferior). The images below show an anterior dislocation, which is the most common. 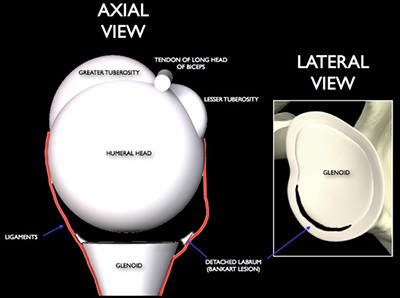 The glenoid labrum is a firm, white structure that forms a ring around the glenoid cavity (the cup of the ball and socket shoulder joint). 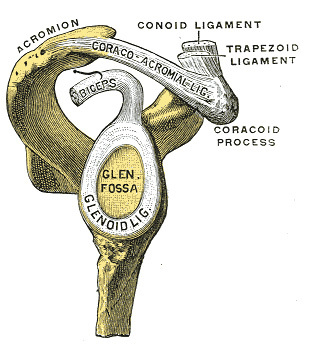 The labrum is triangular in shape in cross-section and thus deepens the socket of the shoulder. It also provides a 'suction-cup' effect to the joint. These two functions mean that it is extremely important in providing a form of stability to the shoulder joint. 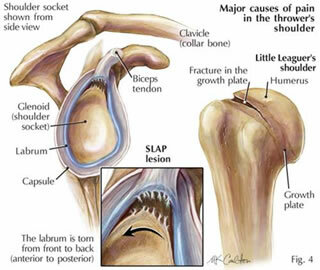 If the labrum is torn the shoulder can become unstable. This is what happens in shoulder dislocations. 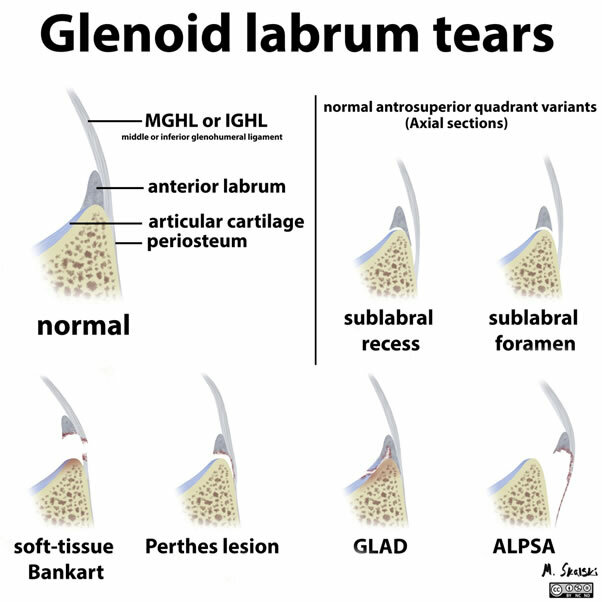 Different injury mechanisms cause different tears in various sites around the labrum. 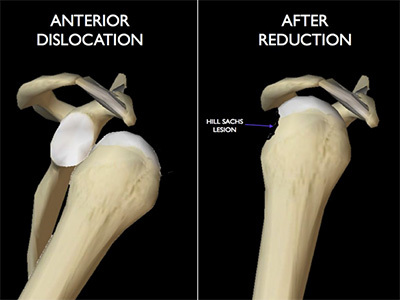 Shoulder instability = your shoulder can dislocate or subluxate repeatedly during active movement or exercise. There can be a number of reasons for this and this will determine the type of treatment you will receive. Traumatic dislocation: This when the shoulder has undergone an injury with enough force to pull the shoulder out of joint such as being tackled in a rugby game, falling of a bicycle or a road traffic accident etc. This is usually the first episode and it would need reducing in a Casualties Unit by a doctor. You would be put into a sling for a period of time and then in some cases would undergo a course of physiotherapy. 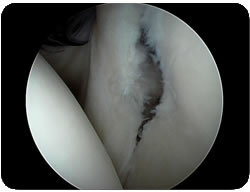 Due to the amount of force that is associated with such an injury the labrum can be torn from the bone (creating a Bankart lesion) and this can result in an unstable shoulder which may lead to further episodes of dislocation. This would be an indication for a surgical procedure called an anterior stabilisation where the torn part of the labrum is repaired. A Bankart lesion is the most common injury sustained with traumatic dislocation, but other injuries can occur. These may alter the surgery and rehabilitation. These injuries can usually be diagnosed on an MRI or CT-scan. Atraumatic dislocation: This occurs when the shoulder dislocates with minimal force such as reaching up for an object or turning over in bed. Usually it will 'pop' back in itself or with a little help. Normally this type of dislocation does not need reducing in a Casualties Unit. It can occur regularly throughout the day and will be associated with certain positions the arm is placed into. This type of dislocation is associated with people that have 'lax' joints (“double-jointed”), for example people who hyper-extend their knees and elbows and can get the palms of both hands onto the floor with ease. This joint laxity is normal for these people and the onset of dislocation can be associated with a change in how the muscles around the shoulder are interacting with each other or a change in posture/ position of the arm. This can produce an imbalance in the control of the joint. Referral for appropriate physiotherapy is the initial form of management. The physiotherapist should look at the way in which the muscles and shoulder joint is moving and posture aiming to restore the balance. Treatment can 'cure' the problem as long as the exercises and advice is continued, but in some cases there is only minimal or nil benefit. At this point surgical intervention is indicated. Positional Non-traumatic dislocations. This group of people can dislocate their shoulders without any form or history of trauma. Some may have started out dislocating their shoulder as a party trick; others may have always had shoulders that just 'fall' out of joint. This type of dislocation is usually painless and can be put back in easily. Both shoulders are typically involved. The cause of this type of dislocation is usually a result of the strong muscles around the shoulder joint that are not working in the correct order causing them to pull the shoulder out of joint with active. The main treatment for this is physiotherapy that looks at rehabilitating the muscles in order to prevent further dislocations. Very occasionally surgery may be necessary. 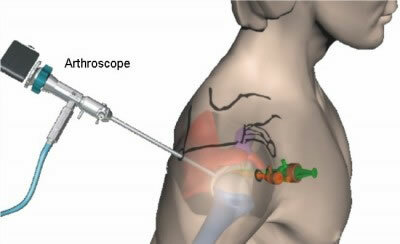 Arthroscopic Procedures - through keyhole surgery. 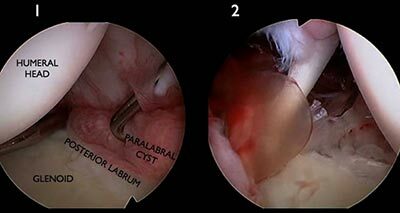 Longstanding labral tears can give rise to paralabral cysts. 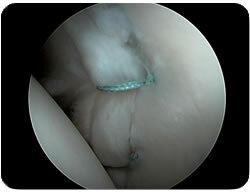 The tear becomes a one-way valve where joint synovial fluid leaks out of the shoulder joint and not back. Depending on the site of the cyst it can press on surrounding nerves. 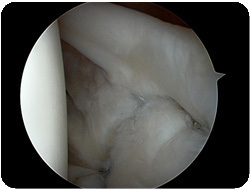 Arthroscopic reconstruction has become the most common surgical treatment of anterior shoulder instability. 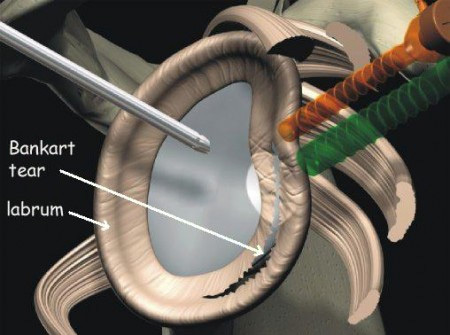 With the use of modern techniques, instruments and materials, the success rate of the operation is very high with a low complication rate. However, there is still a failure rate of 5 to 10% (up to 1 in 10 patients will have further episodes of subluxation or dislocation after surgery). Therefore, it is important that you protect your shoulder in the early stages following surgery and follow your rehabilitation programme. 6 months: progressive return to full sporting activities. Discuss with your therapist or team physician regarding use of a protective brace. Strong shoulder muscles remain the best defence against shoulder dislocation, subluxation, and, thus, instability. Exercises that build up these muscles around the shoulder should be done. The key is to balance the muscles around the shoulder and ensure not only the 'mirror' muscles are exercises (those that you can see when looking in the mirror). Good core stability and posture are also important. Adequate warm-up before activity and avoidance of high-contact sports will help prevent instability-causing injuries.